Supasafe EzyWipes - Meets Australian Government Non Dangerous Goods Criteria. Non Flammable, Non Corrosive No Toxic odours. Ideal for high public traffic areas. The Ultimate Whiteboard cleaner. Will even remove accidental use of non magic markers. 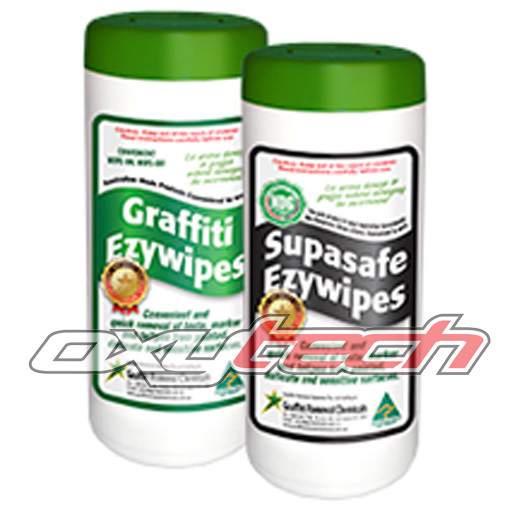 Graffiti Ezywipes and Supasafe Ezywipes are available packed in resealable canisters to prevent drying out. Each canister contains 35 strong, durable wipes.